Enjoy the summertime madness with the Evocrest Beach tent, comes with 1-year Warranty for refunds or replacements, although you just won't need to use it! Summer is finally here and we know you're itching to get your family or friends gathered up for a beach getaway! You need a sturdy, spacious beach tent to act out as that trusty sun shelter that can keep the harsh sun rays away. Our EVOCREST FAMILY BEACH TENT will do just that! Measuring 86 x 47 x 49", it offers enough space for various people and all your belongings and it's made out of 190 T polyester material with PU 1500 and a UPF 50 sun protection, so you won't have to worry about staying in the sun too long. The floor is made out of a 150 D waterproof material, keeping the moisture and water away and the 3 large windows provide enough ventilation to keep the heat at bay. The large tent comes with 3 big inside pockets so that you can store all your beach stuff and more. You don't have to worry about losing your personal effects in the sand or grass, as 2 pockets have zippers, specially designed for valuables like money or phones. The third mesh pocket is perfect for toys, sunscreen lotion, books or any other items you might want to keep stored away. WHILE OTHER BEACH TENTS might not provide the spacious & safe shelter from the sun you need on a long beach day, our EVOCREST POP UP BEACH TENT measures 86 x 47 x 49", ensuring enough space for your family and belongings. It can be set up in 3 easy steps, for less hassle & more fun at the beach! NO MORE HIDING from the harsh sun rays! Our shade tent provides excellent UPF 50+ sun protection, blocking over 98% of the UV radiations. 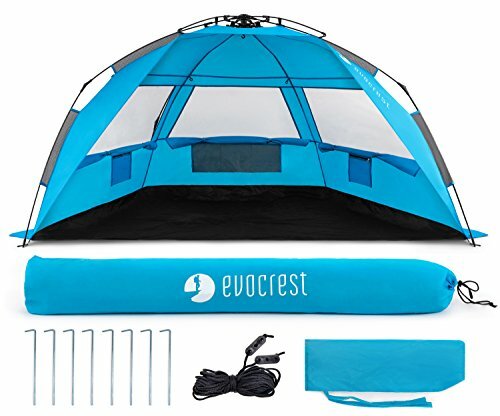 The waterproof floor makes this the perfect sun tent for outdoor activities, whether they're at the beach, camping in the mountains or even your backyard! ALWAYS WORRYING that all your beach stuff won't fit in the tent? Our beach cabana features 3 large inside pockets, 2 with zipper to store your valuables and 1 mesh pocket for toys or other beach accessories. It also comes with 6 outside sand pockets, 2 on each side for added stability and 3 large windows for added ventilation against the heat. WE OFFER YOU the best outdoor experience, so our sun shelter is made from high-quality materials, with a sturdy 0,3" fiberglass frame and 8 steel stakes for easy anchorage in the ground. The beach tent sun shelter weighs only 5 lbs, measures 40x4x5" when folded and comes with a carrying case, so it can fit anywhere & it's easy to take it wherever you go! YOU' LL SIMPLY ADORE YOUR BEACH SHELTER, but don't just take our word for it! Your new favorite equipment for summer hideaways comes with 1 YEAR GUARANTEE just in case it doesn't meet your every standard. We offer you refunds or replacements, no question asked! If you have any questions about this product by EVOCREST, contact us by completing and submitting the form below. If you are looking for a specif part number, please include it with your message.